E ven as the sun shone in the sky, big raindrops started to fall as my daughter and I walked to the car on our way to Bible study. As we drove toward the parsonage, suddenly a brilliant rainbow spread across the sky! Julia immediately pulled our her cell phone and began to take photos. We take those kinds of things personally in our family. We know that Jesus is always speaking, always revealing Himself to those who are willing to see. It is such a delight and a joy to walk through this life with Him, the Author of all beauty. 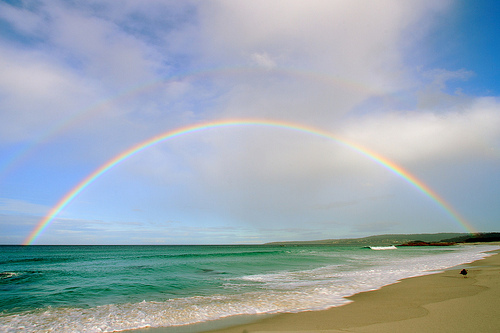 The rainbow…a sign of God’s promise. Tears filled my eyes as I drove, praising God for His incredible mercy, grace, and love. After nearly four years, I am seeing promises fulfilled…promises that I know He gave me as I sought His face and His mind on the matters that were so important to me. I wrote them all down on a now nearly tattered little spiral notebook that I carried with me everywhere I went. I read them over and over, sometimes through tears. I chose to believe them, even when my circumstances said that things looked hopeless. I spoke them aloud when I was feeling particularly vulnerable to the attacks of the enemy and they strengthened me. I allowed no one to steal my hope…because I know my God is faithful and He always keeps His promises…on His timetable and in His perfect way. Now, I have the joy of seeing every one of those promises that He gave me fulfilled…to the very letter. And yes, my heart overflows with praise as I have seen Him do exceedingly abundantly above all that I could have asked or hoped. It is a time of great joy and I mean it when I say that I truly will never get over what He has done for us. I am humbled, I am awed, I am unspeakably grateful. However…my heart overflowed with all these things during the wait too. Oh, certainly not at first. I was ready for Him to fulfill these promises to me ASAP! I am so grateful that He didn’t…because He desired to give me the gift of HIMSELF. He IS the fulfillment of every single promise. As you go throughout your day, ask Him to open your eyes to the signs of His Presence. Consider today a treasure hunt…and rejoice that you have such a wondrous Savior! Cling with all your strength to His very great and precious promises.